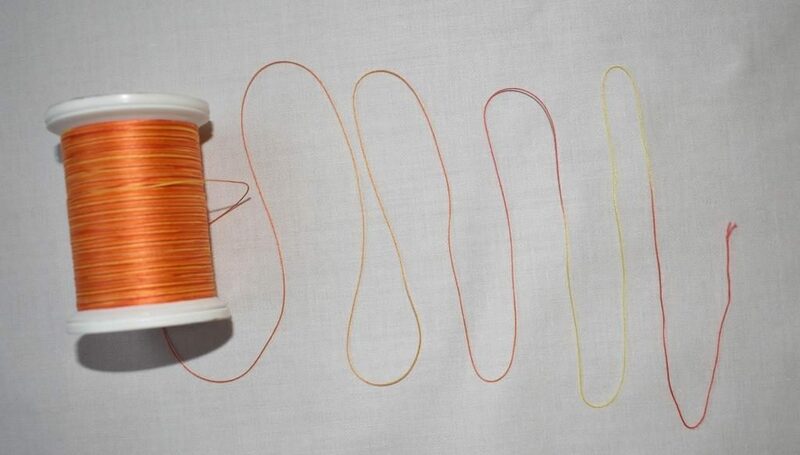 While it is possible to use all sorts of threads for hand quilting, which is the best, and why? What will the finished appearance be like? How easy will the thread be to use? Both of these things are, of course important! 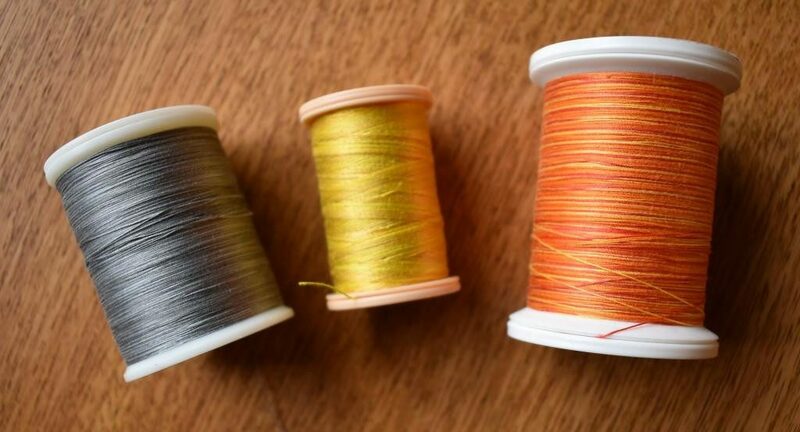 Most people start off thinking about the colour, but it can rapidly become frustrating if your thread twists, knots or shreds – so think about the quality first. I prefer to use thread which has been specially made to optimise it for hand quilting. Because it comes with a waxy, silicone coating, it glides through the fabric easily, and hardly ever tangles. 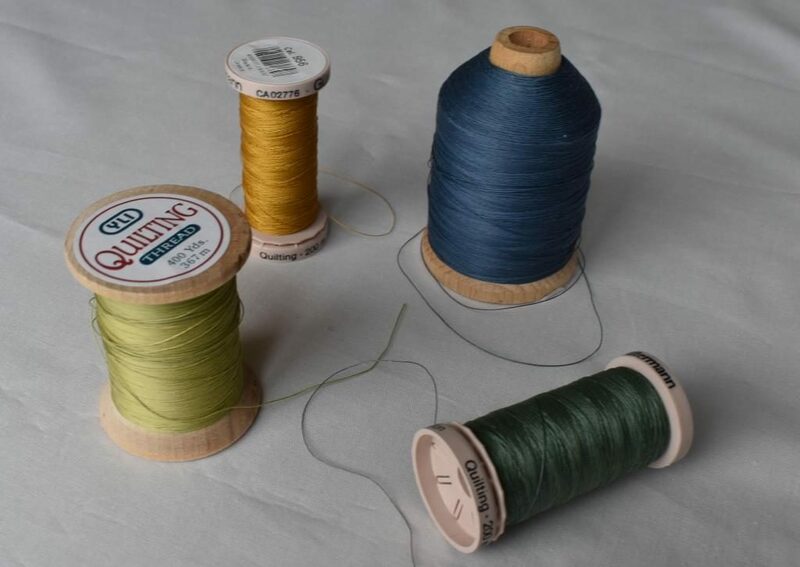 Good makes are YLI (look for the wooden reels, or for YLI Select which is slightly thinner, but very difficult to find in the UK) and Gutermann. 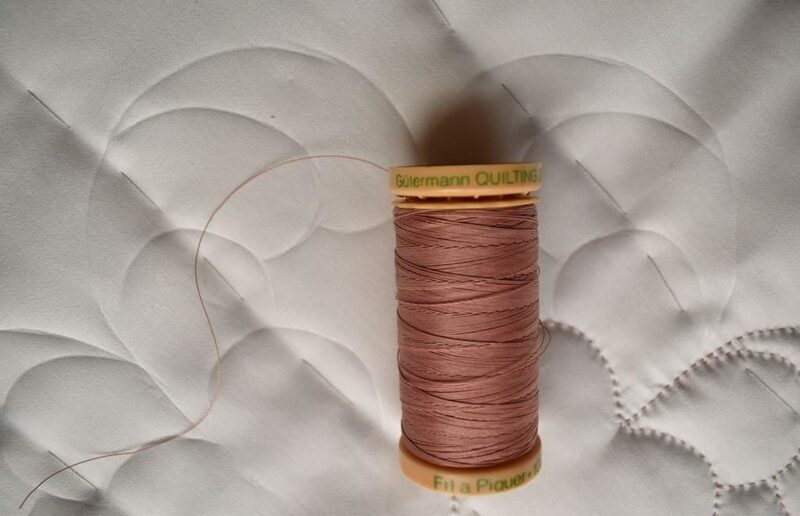 Look out for the words “Quilting” or “hand quilting” on the reel – particularly on the Gutermann, as they make several other types of thread on very similar reels. Don’t try to use these in your sewing machine, by the way – they are too springy. They are great for other hand stitching though – I always use them if I am teaching children to stitch seams by hand. 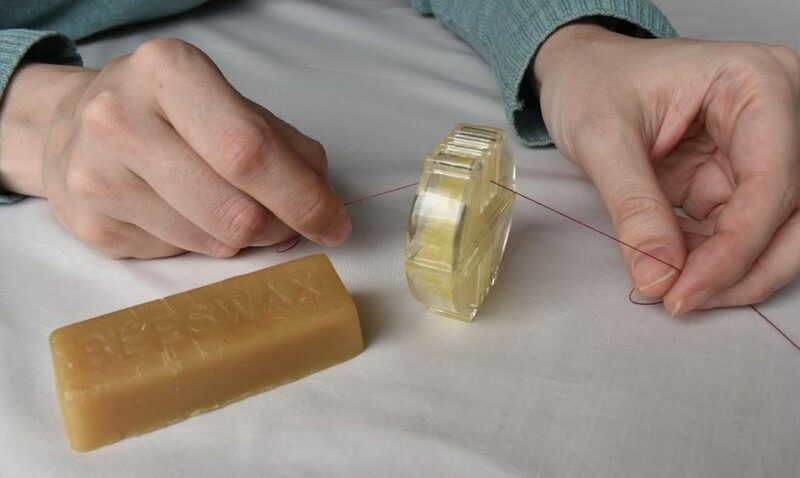 You can buy a block of beeswax, or a piece in a plastic holder. Don’t try to quilt with threads designed for either hand or machine embroidery. These have a looser twist to make them flop over the fabric, but this means they are inherently weaker, and are likely to break when doing a functional job such as quilting. Which colour should you choose? Well of course it depends on the colour of your fabric! What you really need to consider is the amount of contrast against your fabric. If you choose a dark thread, it can look harsh, and will show up every uneven stitch glaringly – so I wouldn’t advise this unless your fabric is very dark. 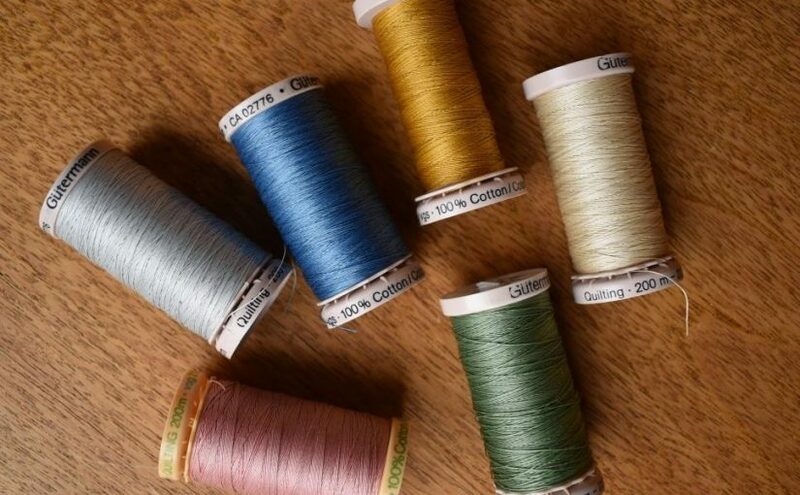 Which thread would you choose against each fabric? It is tempting to search for an exact match to your fabric, but your quilting design usually shows up better if you choose a shade just a little darker, as this enhances the shade in the “valley” created by the quilting stitch. 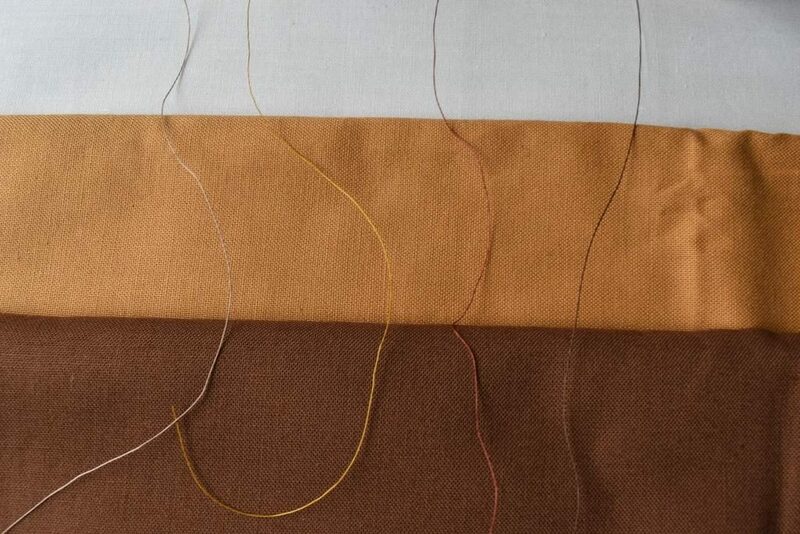 So, medium value threads are often a good choice on light fabrics. Always unwind some of the thread and lay over your fabric to see the effect – you may be surprised which one looks best. This pink thread looks too dark on the reel, but a single strand is less concentrated, and looks lovely when stitched. Then stitch a couple of samples with a scrap of your fabric and the chosen wadding and backing, to make your final choice. I was expecting to use the blue thread, but decided that the green looked better here. Personally, I am not a great fan of variegated threads and rarely use them. They can look tempting in the shop, but if the colour range is too wide, the quilted design shows up more strongly in some areas than others. 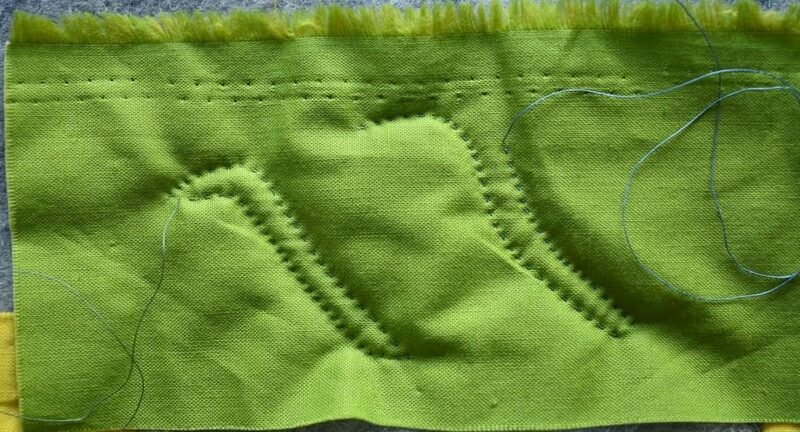 The leaves on the left looks smaller than the ones on the right, because the outer line of stitching disappears into the background fabric. If you do decide to try variegated, look for one with a narrow colour range such as these – and ask the shop owner if you can pull some off the reel to try against your fabric first. This orange one looks quite consistent on the reel, but when unwound, it is clear that the red parts show up much more strongly than the yellow parts. 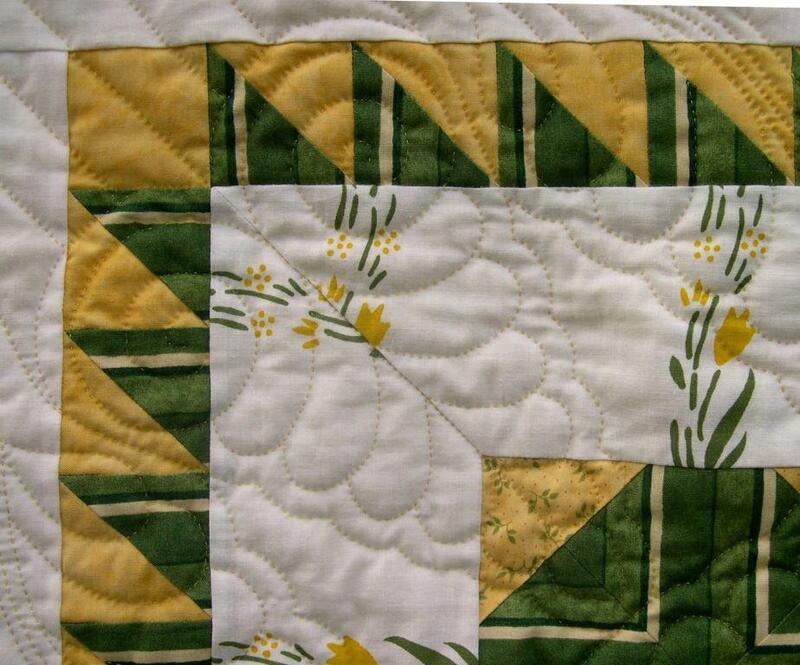 I did use the yellow variegated thread on this little quilt called Durham Spring. In this close up of the scissors motif at the corner, you can see that it gives just a subtle variation in tone. I usually prefer solid coloured threads though – I think this gives a clearer line, and allows the design to take centre stage.